Kettle Cooked Crisps generally have a superior crunch to traditional, thin cut, quick fried Crisps. These Crisps managed to sustain a crunch throughout, with no sign of let up before it was swallowed. There were not many sharp edges from hardened oil. They were just about spot on. 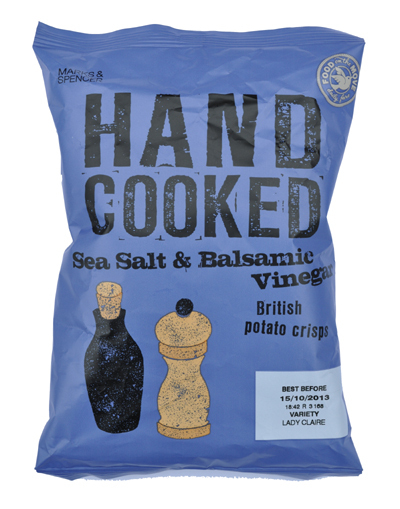 Hand Cooked generally means batch fried in UK Chips and Crisps parlance. This tallied with the additional grease that was saturated throughout the Crisps. Plus the curly and wavy edges of the Crisps. There was a lot of skin visible on edges and while the seasoning was sparse, there was oily and flaky residue . A Nose Plunge Test revealed a calming Vinegar. Not strong, but pleasant. Some Crisps were a little more seasoned than others, but none featured an overwhelming flavour of potato, Salt or Vinegar. It was a fairly well balanced effort that was mild, maybe even slightly sweet, but strong enough to go in for more.